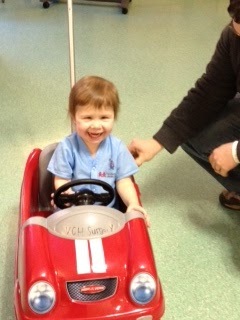 Annabelle did FANTASTIC in her surgery this morning. New tubes went in, doctor said there was a tremendous amount “boogers” as he calls them in her ears, particularly the most in her right ear. Even as we are home, they are still draining some. So yeah for unclogged ears! But even BETTER news is the hearing test. 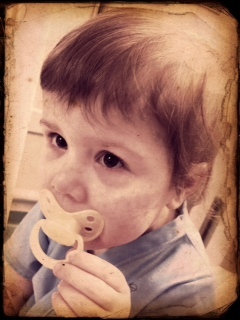 As of right now, Annabelle has ZERO hear loss! Her hearing is A-okay PERFECT! Can I get a WOOHOO Thank you JESUS??????? I’ve been so fretting this… on one hand prayin like crazy that she would NOT have to do the whole hearing aid, but on the other hand, desperitely wanting an answer for her inability to talk. Well, as clogged as her ears were (and probably have been since November, and were prior to first getting tubes in the summer) this is a super good explanation. And now that we have them unclogged, barring them getting gunked up again, she should have fabulous hearing and hopefully start making some good steps toward TALKING! She’s already been jibber-jabbering sounds MUCH more in the past week or two, so I think this final step up will REALLY help. 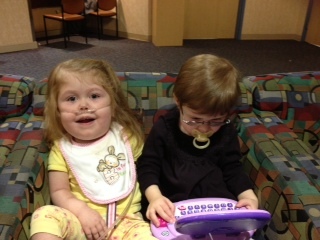 AND… Annabelle and Anna Reese got to spend some FUN time in the OR waiting room! They did what every other little girl would do. 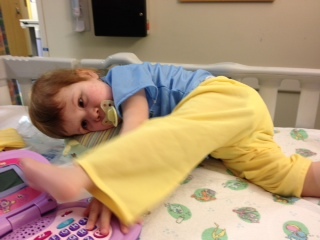 Play on the baby laptop…. Oh my goodness, it SO did my heart good to see them together. They were a bit like, “Huh, why are you making us talk to each other…” but Annabelle was super busy running around the WHOLE waiting room (which is rather large) and was not pleased about me making her stay in one place, ha! 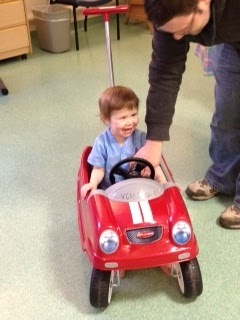 And she had some fun times after she was in the holding area playing in a car! Look, I can type with my foot!!! MAN this place is cool… Well, for now anyway! Anna Reese cheesing for us… Annabelle is into her computer! Yeah, whatever is on that screen must be SUPER funny! Yeah Annabelle. So happy for you, sweetie. YAY praise god! what an awesome report! Praise Jesus!! Thank you for updating your readers on your precious girl. Have a fabulous weekend! Woo Hoo! Congrats Annabelle! Hope Anna Reese did well too. Praying for you and your family. Stay warm this weekend. Praise Jesus! What wonderful news. 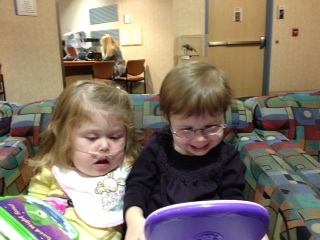 I hope Anna Reese had a good visit as well.